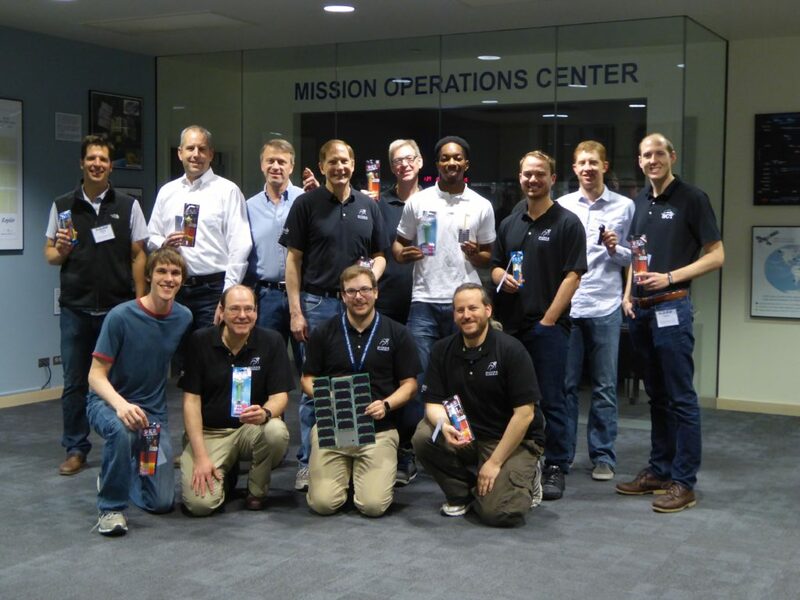 June 9, 2016 – Since the MinXSS CubeSat was deployed from the International Space Station on May 16, a team of students and faculty from the University of Colorado’s Laboratory for Atmospheric and Space Physics has been working through the commissioning process. The spacecraft has been very healthy and the solar arrays and antenna deployed as expected. The team began receiving beacons on the first pass over Boulder and has also been receiving beacons from amateur radio operators around the world, including Japan, Indonesia, South Africa, the UK and Brazil. It has been a much more difficult process getting commands to uplink to the spacecraft. There were some minor issues with the ground station and with help from other universities and businesses, the team was able to get their first command through to the spacecraft on May 19. On that date, they were able to stream real time ADCS telemetry and set the spacecraft time. On May 26, the MinXSS team was able to get the spacecraft in fine pointing mode. To keep itself pointing very precisely toward the sun, MinXSS uses an XACT attitude determination and control system built by Blue Canyon Technologies of Boulder, Colorado. The change from coarse sun pointing to fine reference pointing was part of the commissioning process and also had to be done by command. The team continued to get intermittent commands up to the spacecraft and put MinXSS into science mode on May 27. That meant that the primary science instrument, the X123, was powered on and started taking measurements. The X123 observes soft X-ray emissions from the sun and will allow scientists to better understand how incoming radiation impacts Earth’s ionosphere, thermosphere and mesosphere. The intensity of the soft X-rays emitted from the sun is continuously changing and can disrupt Earth’s upper atmosphere and hamper radio and GPS signals traveling through the region. 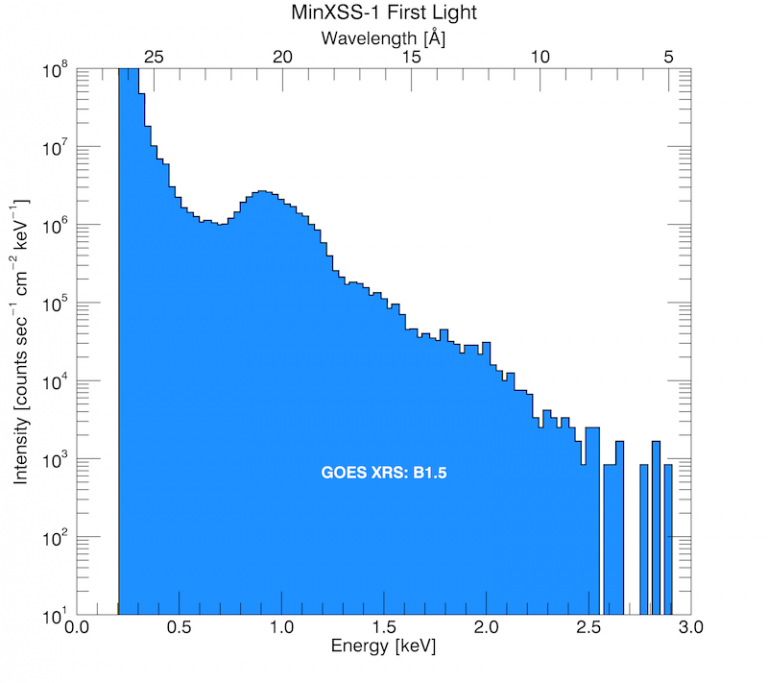 MinXSS collected its first rough, solar soft x-ray spectrum on May 27. The GOES XRS measurement is the accepted standard for defining flare class and background emission. There were no flares when this first spectrum was taken, so the GOES XRS refers to the background x-ray emission. A level of B1.5 is exceptionally low, which shows that the sun was really quiet when the spectrum was observed. The MinXSS team continues to work through the communications issues, but they’ve recently replaced the 100 W power amp of the ground station with a 550 W one, which means that the command uplink transmission power is significantly stronger and they can now reliably get commands into the system. Greater than 90% of the commands are now going through to the spacecraft. On a less positive note, one of the electronics components on the spacecraft was hit by an energetic particle. This event, which is referred to as a “single event upset,” hit one of the chips that measures voltages/currents or temperatures and caused the communications bus where the measurements are made to hang up. A soft-reset was tried, but the issue persisted. The team developed a plan to operate in a mode where the flight software couldn’t read the battery voltage. Although it might work, it isn’t ideal because the battery voltage is an important health monitor for the spacecraft. Fortunately, when the system did a full hard reboot, it cleared the issue. The team will save that fix for the future, should another single event upset occur. All of this has been a great learning process for CU-Boulder students working on the mission and they expect to complete commissioning by the end of the week. MinXSS will operate for up to 12 months and study solar flares, active regions, the quiescent sun, and the relationship between solar activity and the Earth’s upper atmosphere. 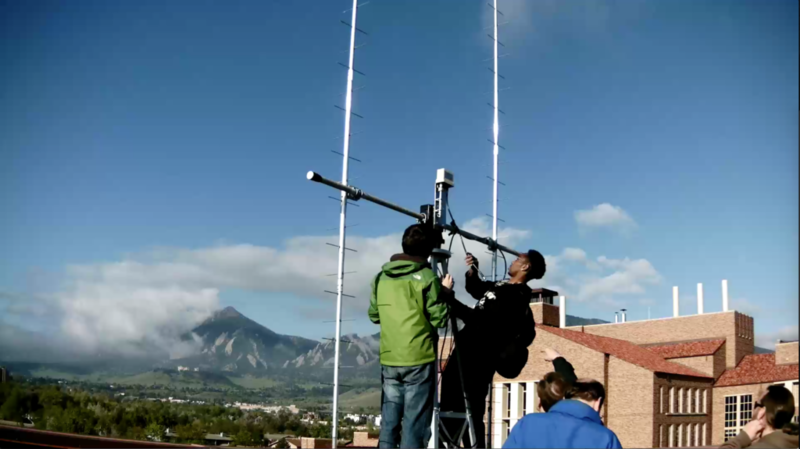 MinXSS is a 3-Unit (3U) CubeSat built and operated by University of Colorado Boulder students and faculty at the Laboratory for Atmospheric and Space Physics (LASP) and the Aerospace Engineering Sciences Department (AES).